Cricket and baseball are similar in that both involve balls and bats, but when you get down to the actual game mechanics, the sports are worlds apart. That’s evident in the new movie Million Dollar Arm, which tells the true story of Rinku Singh and Dinesh Patel, who both competed in an Indian reality show launched in an attempt to find—or create—the next great Major League Baseball pitcher by looking to India’s greatest arms. Jon Hamm is the big-name star of the movie, but Singh and Patel are the real stars of the experiment: The Pittsburgh Pirates offered contracts to both after the completion of the reality show in 2008. Only Singh is still pitching in the States; Patel returned to Delhi to teach baseball to Indian kids and to train for the national championships in javelin, another sport in which both men previously excelled. Million Dollar Arm might be based on a true story, but The Cutting Edge is anything but. The film tells the tale of rich, spoiled figure skater Kate Moseley (Moira Kelly), whose prickly personality has lost her various skating partners and subsequent chances to win as part of a pairs team. Enter Doug Dorsey (D.B. Sweeney), former hockey player and all-around brute who’s looking for another shot at Olympic glory after suffering an eye injury in his last competitive game. Though Dorsey has skating prowess and muscles to spare, he lacks the artistic flair and team spirit required for pairs skating. Moseley and Dorsey clash, practice, and ultimately fall in love, proving that (in the movies, at least) all you really need to excel in a sport is the barest sense of the concept and a reasonable set of companion skills. When Olympic hopeful Derice Bannock (Leon) gets tripped up in a qualifying track meet, his dreams of Olympic gold are all but dashed. Instead of acquiescing to defeat, Bannock sets his sights on any Olympic sport that could conceivably bring him a medal, and with that, the Jamaican track star turns to bobsledding in the hope of achieving his dream. After assembling a ragtag team and aligning himself with the only qualified bobsled coach on the island—former Olympian Irving Blitzer (John Candy)—the Jamaican bobsled team undergoes a series of follies in the pursuit of Olympic glory, even if it ends in personal fulfillment instead of a ticker-tape parade. The films of Disney’s Mighty Ducks series concern whole schools of fish out of water, beginning with the first movie’s big-shot lawyer Gordon Bombay (Emilio Estevez) serving a community-service sentence as a youth-hockey coach. In subsequent movies, Bombay’s charges experience culture shock at a Goodwill Games offshoot, and learn all about class warfare while serving as the junior-varsity squad at a preppy private school, all the while welcoming teammates who started their athletic careers sans helmet and pads. The Mighty Ducks introduces figure-skating converts Tammy and Tommy Duncan (Jane Plank and Danny Tamberelli), whose agility on the ice is boiled down to a single character in the sequels’ “former Olympic skater” Ken Wu (Justin Wong)—because who’s going to buy Little Pete Wrigley as the next Scott Hamilton? Wu’s partner in introducing the Ducks to new athletic disciplines is Dwayne Robinson (Ty O’Neal), an import from the Lone Star State whose drawl sounds more West Texas than his supposed hometown of Austin. With Big Bads hailing from Iceland—the country’s fictional powerhouse status belying a sorry record in real-life international competition—D2 needs no help straining plausibility, but the film’s sense of reality evaporates the moment Dwayne delves into his rodeo skill set to save a threatened teammate. Obviously, the call on the ice isn’t for “roping,” unnamed play-by-play guy—it’s a simple too-many-players-on-the-ice penalty. The Replacements makes a series of dubious claims (the most egregious of which is that Keanu Reeves can play football), including the idea that being good at soccer somehow makes you prepared to kick field goals in the NFL. After a players’ strike in the middle of the season, the fictional Washington Sentinels are forced to replace their entire team with also-rans and players from other sports. Nigel “The Leg” Gruff, played by Rhys Ifans, is a smoking, swearing Welshman known for his ability to kick a soccer ball from one end of the field to the other. Because in the world of The Replacements kicking a soccer ball and a football are exactly the same, Gruff earns a place on the Sentinels and saves a pivotal game by completing a 65-yard field goal (which actually beats the current NFL record by a yard). The Replacements is supposedly loosely based on the 1987 players’ strike, but clearly the filmmakers weren’t that interested in believability. 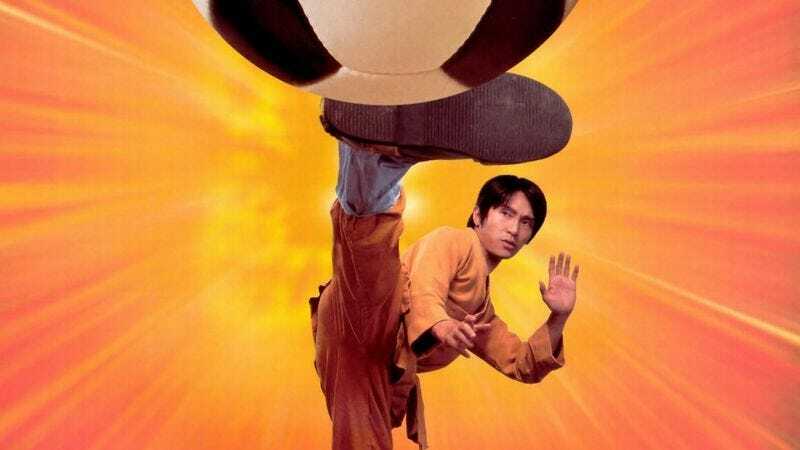 To Americans, the idea of a movie equating kung-fu mastery with professional soccer skills may seem like an awfully random grab-bag of elements, but it’s actually a pretty calculated bid for international success: Blending the most popular sport in a sizable chunk of the world with the most familiar and beloved cinematic export from another sizable chunk of the world all but guarantees at least some box-office popularity. Add in the lunatic, Looney Tunes mayhem-humor of writer-director-producer-star Stephen Chow, and the appeal broadens even further. For something so obviously crafted for broadband international appeal, though, Hong Kong’s Shaolin Soccer is mighty weird and specific in a lot of its humor. But the basic story, about a group of disgraced, disheartened Shaolin monks who form a soccer team to promote kung fu, regain their self-respect, and eventually fight an evil team and their evil coach, is a comically exaggerated version of every underdog-team sports movie ever. It’s just that in this case, the CGI-assisted underdogs can fly through the air, scatter opposing team members like ninepins, and kick a soccer ball hard enough to turn it into a rampaging puma made of fire. Is there a sport that couldn’t be made better with the participation of a lovable dog? Certainly Walt Disney Films didn’t think so. After the success of 1997’s Air Bud, where an orphaned golden retriever proves smart and quick enough to compete on a high school basketball team, the studio eagerly decided that the dog’s remarkable abilities could be applied to other activities. Buddy’s athleticism and adorableness would carry him to four more sports: football in Golden Receiver, soccer in World Pup, baseball in Seventh Inning Fetch, and volleyball in Spikes Back. Far from being a mascot, he’s able to succeed in all five because of his remarkable timing and ability to fetch at high speeds, skills that would lead him to become the only individual (man or dog) to win both the World Cup and the World Series. Who’s a good boy?